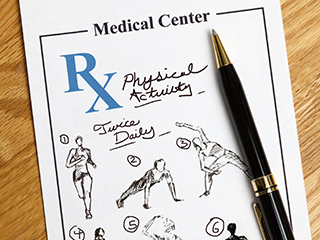 The next time your doctor reaches for his prescription pad, don’t be surprised if he recommends exercise instead of medication. A growing number of healthcare providers are encouraging patients to think of physical activity as their new medication. A study published in the British Medical Journal found that exercise affects outcomes for some serious medical conditions about equally as well as prescription drugs. For example, exercise provided better outcomes in patients rehabilitating after a stroke, and for people with coronary heart disease and pre-diabetes, exercise and drugs had about equal outcomes. This is not to say that patients should throw their prescriptions away. Medication is necessary for the successful treatment of many conditions. However, the study supports the idea that many patients would benefit from their doctors prescribing exercise. In general, people who are physically active tend to live longer and are at lower risk of heart disease, stroke, Type 2 diabetes, depression and some cancers, according to the Centers for Disease Control and Prevention. And since obesity is linked to serious health problems, exercise leading to weight loss can also help reduce the risk for conditions such high blood pressure, heart disease and stroke. This isn’t surprising. Our bodies are meant to move, so incorporating exercise into our day allows them to work optimally. That includes our brains: physical activity improves sleep, mood, cognition and the ability to concentrate. Exercise isn’t the answer to every health problem, but it can play an important role in the treatment and prevention of disease. Talk to your doctor about how a “prescription” for exercise can help you. The CDC recommends weekly exercise and strengthening activities for adults. This can include physical activities such as labor, yardwork and housework. Also, you don’t have to do all of your exercise at once; you can spread your activity out during the week. You can even break it up into smaller chunks of time during the day, as long as you do at least 10 minutes at a time. The following options will give you the activity levels you need for better health. Weight training/muscle-strengthening activities on 2 or more days a week that work all major muscle groups (legs, hips, back, abdomen, chest, shoulders, and arms). Weight training/muscle-strengthening on 2 or more days a week. 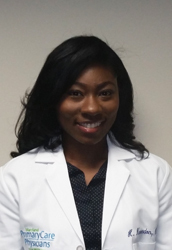 Harriett Neverdon, Family Nurse Practitioner-Certified, sees patients in MPCP’s Columbia office. She received her Bachelor of Science in Nursing degree from Towson University and her Master of Science in Nursing degree from University of Maryland School of Nursing. She is board certified by the American Association of Nurse Practitioners in Family Practice.